It’s amazing that in the decades since Porsche built the giant flat-twelve engines in the Le Mans-winning 917 racers of the late 60s and early 70s, mankind has not been capable of making a more aurally pleasant engine. The prophecy was foretold that one true best-sounding engine would come, and it did. Porsche nailed it with this one. Rumble. Grumble. GRAWP GRAWP GRAWP. Gumble wumble wumble. ROOOOOOAWWWWW. 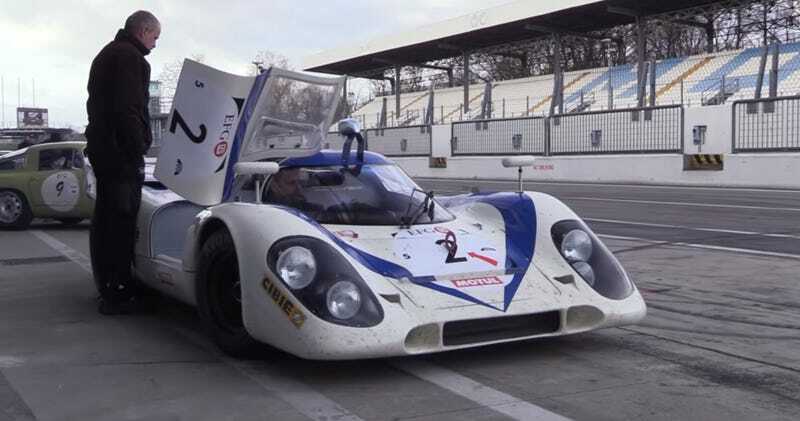 Either way, this 917 rules the school, and is happy to go wailing around the track at what seems like a million miles an hour. This thing looks like a rocket ship now, I can’t imagine what it must have been like to see it racing in France in 1970. Too awesome to fathom, I assume.